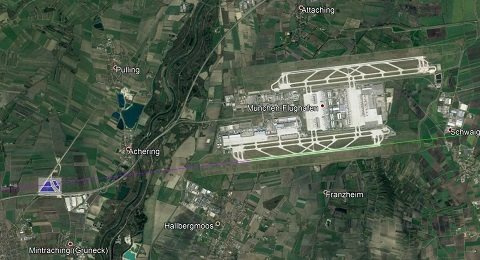 Airplanes taking off or landing at the airport would pass approximately 500 m directly above the PV-park, thus the reflections towards air traffic has to be analyzed. With large reflecting surfaces, you can almost always find a spot, that will be exposed to reflections at certain times, like in this case. However, the more important question is, whether the expected effect of the glare could be dangerous to air traffic. The sometimes stated demand of zero reflections ( = complete avoidance of glaring) in many cases cannot be techically implemented. In most cases, zero immissions are also not a necessary requirement. Much more important in these cases, is the investigation of the other parameters of the potential light immissions on the pilot. The direction of the reflecting areas in the field of view and the duration of the immissions (in this case a few seconds) are among these more relevant factors. The planned Solar-park is situated at a railroad intersection of the Munich-Regensburg rail track, as well as next to the autobahn A92. As a consequence, potential glaring hazards towards railroad and road traffic had to be studied. The glaring calculation revealed, that at certain times reflections would occur, which could be a danger to road traffic on the highway. Dazzling was limited to a few minutes of the day, however due to the proximity of the photovoltaic panels to the road, the drivers' field of view would have been limited to such an extent, that drivers could have had difficulties to recognize approaching hazards (e.g. the break lights of the car in front) in time. Consequently, an opaque fence, hiding part of the PV park from the drivers' view, has been suggested as a measure of glare reduction. 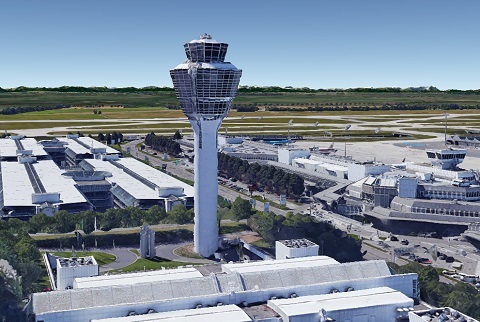 Also at Nordrhein-Westfalia's airport Paderborn-Lippstadt (PAD) a solar glare assessment has been executed, The approach-sector of Paderborn Airport is located close to the planned solar-field, as the air traffic handbook of the German Air-traffic Control showed. Due to this proximity and the request of the airport-operator at the rural district office Soest, a glint and glare study had to be undertaken. The glare calculation verified that only short time reflections in the range of a few minutes per day were possible. Due to this and due to the direction of the reflected light coming-in sideways to the airplanes, the reflections were rated harmless for air-traffic. Zehndorfer Engineering frequently conducts Glint and Glare Assessments for Solar Parks and Glass Facades. Jakob Zehndorfer is Expert Witness for Glint and Glare at the Austrian Court of Law.